A while back Snoop Dogg (Lion) released his own iOS app called Snoopify to allow anyone to look more like the veteran rapper, via a variety of themed stickers in the app. In an interview with Evelyn Rusli from the Wall Street Journal, Nick Adler, Snoop Dogg’s brand manager revealed the premium sticker was added last minute on a whim and was “shocked” to discover $1,500 was made after it was released–meaning at least 15 people shelled out a hundred bucks for a digital sticker. 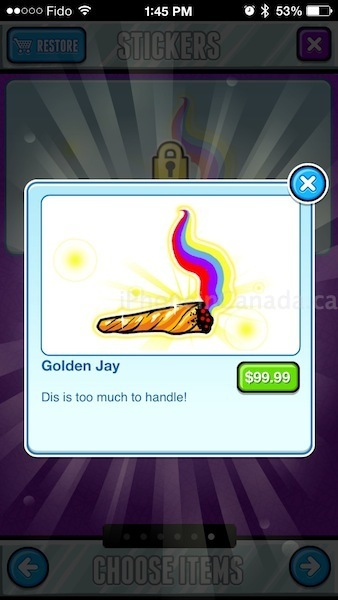 Would you ever pay $99.99 for the Golden Jay? The fact people decided to shell out this amount of money for a digital sticker shows us humanity is doomed, right?